It’s almost Thanksgiving in the States, which means it’s also the start of the holiday shopping season. News broke a few weeks ago that the majority of the latest Apple laptops are devoid of any optical disc drive, suspiciously pointing to Mac’s subtle intention to do away with the technology. Though Apple may be moving away from hard disc storage in favor of USB or cloud-based storage (or maybe they just decided to sacrifice disc drives in order to make the Macbooks even sleeker and slimmer), it’s not impossible or even difficult to still play CDs, DVDs and Blu-Rays on these driveless Macs. All it takes is an external disc drive. For those die-hard DVD or Blu-Ray fans, you’ll still want a way to play your discs on a new Mac, and this year on Black Friday, there are a slew of sales that will surely help you find that special piece of technology you’ve been looking for. While Apple retails their external disc drives for around $79, other brands offer a better deal. Click on the ad to be taken to the site. 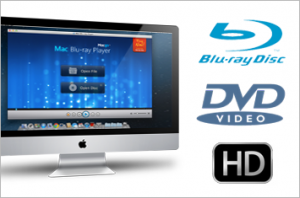 Macgo is offering a special discount for their Mac Blu-Ray Player up until November 25th. The Macgo Blu-Ray Player will be available for $39.95, a 33% markdown from the regular $59.95. The same price discount applies for the Windows Blu-Ray Player for PCs. Also, the Blu-Ray Suite for both Mac and PC is marked down from $119.99 to $54.95. Who doesn’t love Black Friday deals you can buy online? You don’t have to worry about long lines or pushy soccer moms to get this great deal. This year, the Blu-Ray Association authorized Macgo, a leading multimedia company, to become an official Blu-Ray product manufacturer. Macgo’s Mac Blu-Ray Player is the first Blu-Ray player for Mac OS, supporting versions 10.5 up to the latest 10.8. The newly upgraded version of this player allows Blu-Ray streaming from a Mac computer to Apple mobile devices like an iPhone or iPad and it also has a built-in wireless AirX function. Just plug in the USB from the Blu-Ray Player to your Mac and watch high-quality Blu-Ray without any frame loss. There is also a function to recommend movies on Facebook or Twitter. You’ll also need free Blu-Ray player software, which is available for free online. And why not pick up some blank Blu-Ray discs to record your favorite memories and maybe even get started on that holiday slideshow you’ve been salivating over? 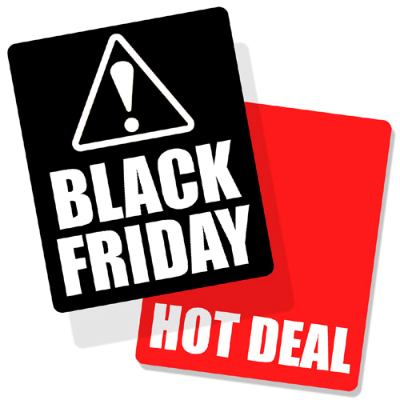 Black Friday: Worth the Wait? Every year it seems like the Black Friday madness gets crazier and crazier. Since the U.S. economy took a nosedive in 2008, holiday shoppers may be on an even more constrained budget than usual, making the drop-down prices of Black Friday even more appealing. What are the crowds like this year? While the economy is still struggling after the crash of 2008, Black Friday sales are expected to rise 2.8% from last year, as 150 million people try and snag the best soon-to-be-expired bargains. 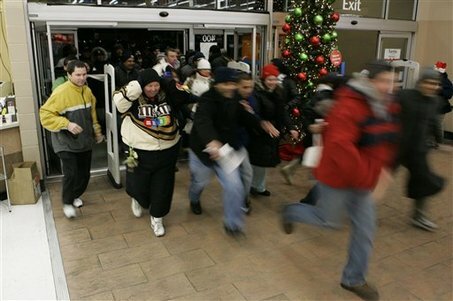 Since the U.S. Census Bureau currently calculates the U.S. population to be 312 million, that means about half the country will be partaking in the mad holiday dash, and to the tune of roughly $465 billion, according to the National Retail Federation. This year, even Apple, a company infamous for never having any deals, offered certain meager holiday discounts. 2011 is a year of many firsts – it marks the first year that many retail stores across the country opened their doors at midnight, instead of opening early in the morning as usual, while some stores simply never closed. 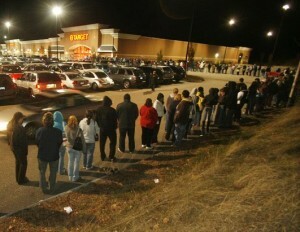 How soon until people forego their Thanksgiving meal altogether in order to wait in line for a half-priced toy? The term Black Friday was supposedly coined in the 1960s after Philadelphia police officers had to deal with massive traffic jams on the weekend after Thanksgiving, but the term solidified in the 1980s, when the popular theory became that people were taking their checkbooks out of the red and into the black. Black Friday could have another meaning as well. The ferocity and violence that possess many consumers on the Friday after Thanksgiving has given many a crazed shopper a black eye – or worse. Perhaps the worst case of shopping violence occurred in 2008, when a retail worker at Wal-Mart, 34-year old Jdimytai Damour (weighing in at 270 pounds, 6 feet 5 inches), was trampled to death by the savings-hungry mob. Has the economic meltdown taught the U.S. consumer base nothing about balancing our bank accounts, other than to become more and more vicious? Half the country is out shopping ‘til they start dropping, but is it really worth it? Some truly think so, and for families on a budget, this may be the one day of the year when they feel they actually have a chance to buy Timmy the video game system he really wanted or embellish the home with a new TV. 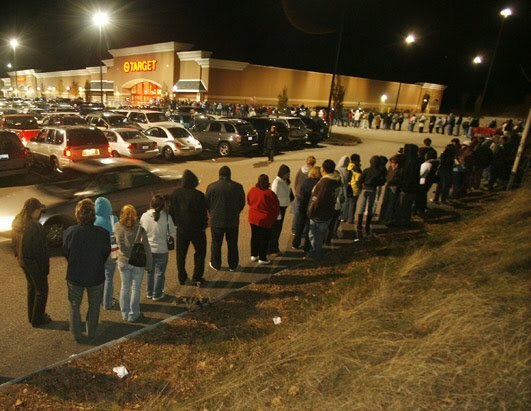 Some people have even been reported to have started waiting in line for Black Friday deals since Monday. There may be solid reasons for struggling families to endure the biting cold and banality of waiting in line for days, just to grab a limited-time only deal, but there may also be other ways to save the pocketbook while ensuring a happy holiday season. 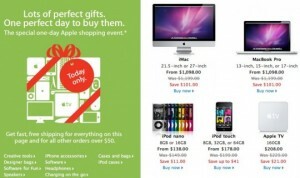 In 2005, Cyber Monday was born. Whether it is complementary or competitive with Black Friday, Cyber Monday marks another holiday bargain-busting day, this time bringing Internet retailers into the mix. 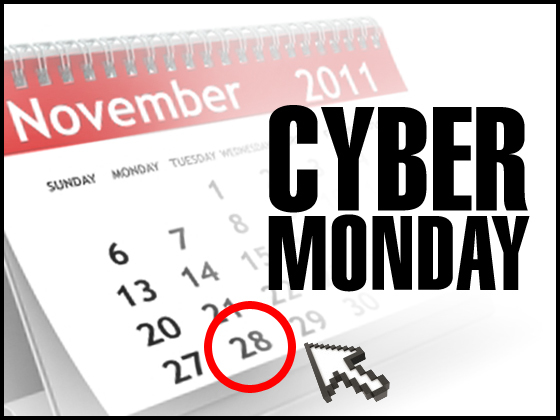 Cyber Monday refers to the Monday after Thanksgiving when most people return to work, and when a massive number of Internet retailers offer their special holiday deals. The advantage of Cyber Monday is that no one risks serious injury, no one has to wait in line for days, and no one is wearily shopping up and down the aisles at 3 in the morning, a time when some bad shopping decisions might be made. 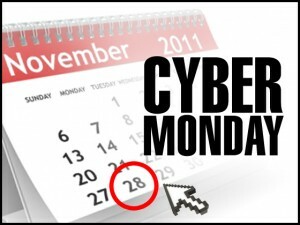 Cyber Monday allows shoppers to browse deals from the comfort of their home or office, and while there may be a limited amount of items or an expiration date to the deals, the stressful frenzy is not nearly as present. So far, the Internet hasn’t seemed to change things too much on Black Friday, since this year already shows 150 million people out shopping, but it is nice to know that some great deals can be found online without having to battle through barbarous crowds.